This month we roll-up all the new features that we have been working in into this blog. Performance - done. New bank features - done. New graphs - done. Improved QuickBooks Desktop integration - done. 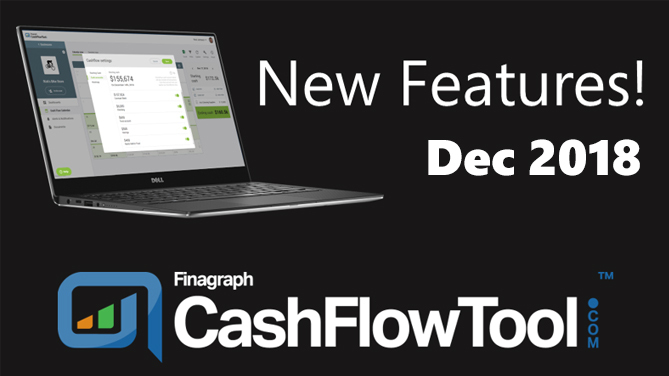 We are excited to announce several new features that will give you a finer degree of control of your cash flow. You asked for it and we delivered. You can now choose which bank accounts are included in your cash flow calendar and forecast and exclude accounts that should not be included. For example, you may have a dedicated account reserved for your employee’s health savings account you do not want included in your forecast. Now you can see what your cash flow forecast looks like with these accounts excluded. 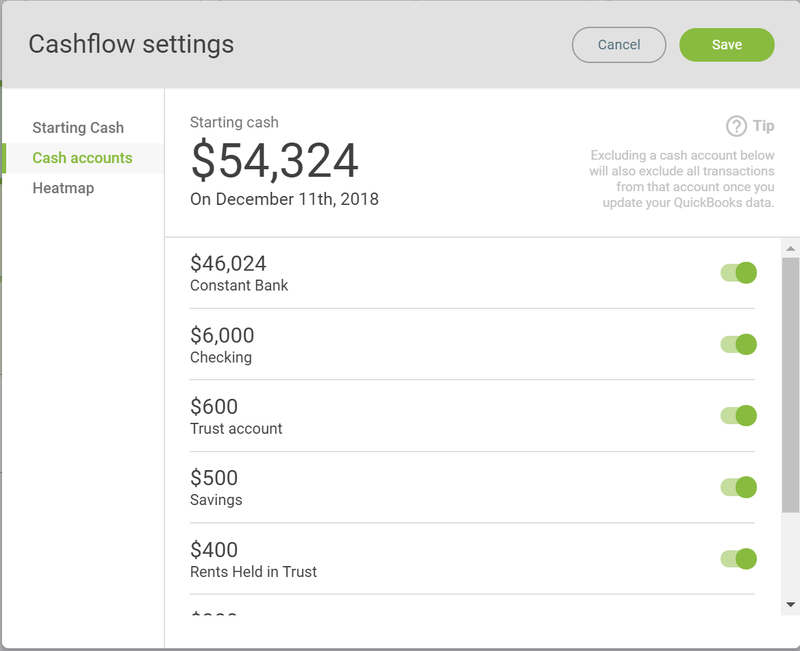 To exclude cash accounts, select the Cash Flow Calendar tab and select the Settings options. We have enhanced the detailed view of the cash flow calendar to show payment history from customers and vendors. When you select a transaction, a graph displays past payment history, along with future forecasted transactions. At a glance, you can see their payment history and what to expect in the next few weeks. At the bottom of the graph is a zoom slider allowing you to select the level of detail to show in the graph. The solid line shows actual payments made, and the dashed lines show forecasted transactions based on historical payments made. 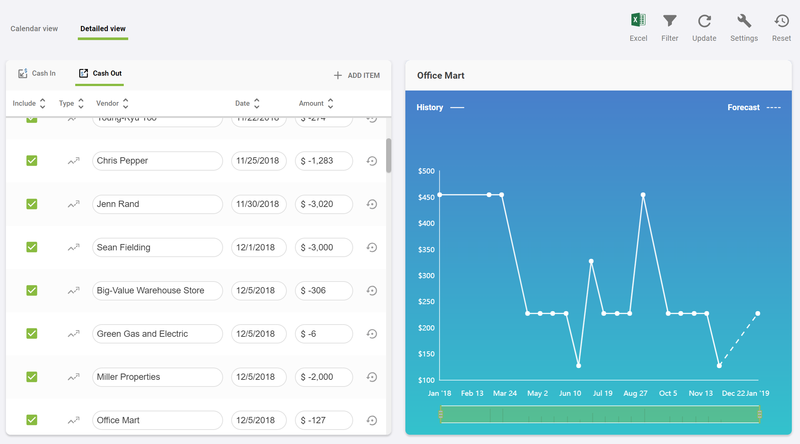 We have continued to improve performance and functionality of the QuickBooks Desktop Connector which makes it seamless to extend your QuickBooks Desktop into the cloud with critical future metrics and forecasts. We have also improved interoperability with Right Networks for those businesses that run QuickBooks Desktop in a managed environment. Read more about the functionality here. Michael is the Lead Product Manager for CashFlowTool where he oversees the product development team, feature set and overall product direction. © 2019 Finagraph All Rights Reserved.